LISTEN to today's conversation with Jamie Bartlett, author of The People VS. Tech. Facebook’s Cambridge Analytica scandal is just the latest example of how digital technology is profoundly impacting all of our lives. Bestselling author Jamie Bartlett is a firsthand expert: he reported to the BBC back in August 2017 that Cambridge Analytica, the Republican party and Facebook all worked together on the Trump digital campaign in the same office in San Antonio, Texas. Now, he shares his book, THE PEOPLE VS TECH, an urgent examination of where democracy is heading in the digital age…and what we can do about it. News today is rife with stories about ‘big tech’, Russian hackers, and Facebook’s growing role in politics. The truth is simple: digital technology and our democracy are incompatible. We must reform democracy and reign in digital disruption within the next twenty years, or risk losing democracy for good. Proposing twenty bold, radical proposals for how to do this—including dramatic new government policies, laws, and citizen fightback, Jamie Bartlett reveals a comprehensive and often shocking roadmap of where democracy is heading: a techno-dystopia where freedom is traded for security and efficiency. · How technology unexpectedly tends to result in monopolies. Tech firms are already transferring their economic power into political power, but they differ from traditional monopolies in important ways. By owning the platforms on which material is published, they have an important influence over public opinion and activism itself. · Instead of worrying about a ‘jobless’ future, we should be more concerned about the growing inequality and whether the coming tech revolution will wipe out the middle class and threaten democracy. · Information overload and connectivity has encouraged a divisive form of emotional tribal politics, in which loyalty to the group and anger outrank reason and compromise. While partisanship is necessary in politics, too much of it is dangerous. Political leaders are evolving to the new medium of information—hence the rise of populists who promise emotional, immediate, and total answers. · We live in a giant advertising panopticon, which keeps us addicted to devices; this system of data collection and prediction is merely the most recent iteration in a long history of efforts to control us. It is getting more advanced by the day, which has serious ramifications for potential manipulation, endless distraction, and the slow diminishing of free choice and autonomy. 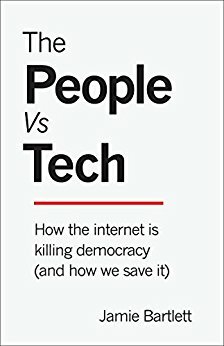 THE PEOPLE VS TECH is a must-have guide for citizens of the world to understand how the concentration of power, data, and control over the public space is already affecting our everyday lives, and what we can do about it—before it’s too late. Jamie Bartlett is the bestselling author of The Dark Net, an examination of the hidden corners of the internet and Radicals: Outsiders Changing the World. He is the director of the Centre for the Analysis of Social Media at the think-tank Demos, where he has written several pamphlets about the internet and democracy. He also writes on technology of the Spectator, and several other publications on how the internet is changing politics and society. In 2017 Jamie presented the two-part BBC TWO documentary series The Secrets of Silicon Valley. He lives in London. His TED talk about the dark net has over 2 million views.